Nigerian Chinua Achebe was the first African writer to publish a major novel in English – a novel in the colonial master’s language. Published in 1958, Things Fall Apart tells the story of Okonkwo and his traditional Igbo village and the devastating transformation it undergoes with the arrival of British colonialists. But the novel is every bit as much about Okonkwo as a tragic hero – his story regardless of time and place – as it is about the damage wrought by Europeans. Things Fall Apart demanded that the Igbo be taken on their own terms. Now almost sixty years later, Nigerian literature has expanded considerably. In Chimamanda Ngozi Adichie’s 2013 novel, Americanah, the main characters live in Nigeria, the United States, and England. If not completely comfortable in all of these worlds – or indeed maybe not comfortable in any of these worlds – they nevertheless figure out how to move in these worlds. The two main characters – Ifemelu and Obinze – are modern, urban Nigerians. Hailing from Lagos, the capital city of the West African nation, their postcolonial Nigeria is a place of power-shifting, power-grabbing corruption. Both extremely bright young people, they go their separate ways – Ifemelu to attend university in “Americanah” (as the Nigerians call it), Obinze to England to seek a new life. Eventually, they both return to Nigeria, determined to make a go of it in their home country. All that transpires from their youth in Africa to their adventures in North America and the U.K. to their return to Nigeria is the stuff of a long, complex novel – and I won’t give away anything about the many twists and turns of the detailed plot. Chinua Achebe, who died in 2013, the same year Americanah was published, might not have recognized the Nigeria of Adichie’s novel. It certainly seems that Lagos has developed in ways Achebe might have anticipated but never personally witnessed. I suspect, though, that he might have seen some of his own experiences in Ifemelu’s journey to study in the western white world. Born in Nigeria, Adichie now divides her time between her home country and the United States. She is the recipient of a MacArthur Foundation “genius” award. To learn more about Adichie and her work, visit her website. You’ll also want to stop by the independent website about Adichie, which has a treasure trove of links to seemingly endless essays, articles, and more by the Nigerian writer. If you’ve got some time to invest in a long, winding novel, you just might consider curling up with Americanah . The best-selling and critically acclaimed book will leave you eagerly waiting for the film adaptation, which is set to star Lupita Nyong’o and David Oyelowo. 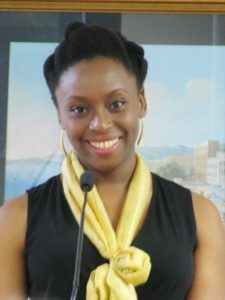 Image Credit: 2013 photograph of Chimamanda Ngozi Adichie, by SLOWKING. Used with permission https://en.wikipedia.org/wiki/File:Chimamanda_Ngozi_Adichie_9374.JPG. I loved this book! Also read her Purple Hibiscus. Thanks for this thoughtful review.